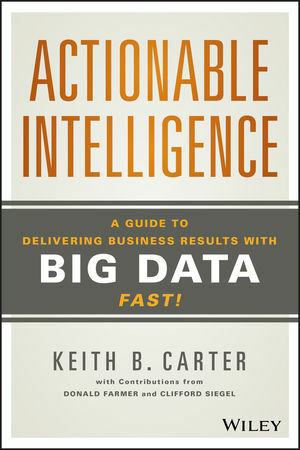 Keith Carter's Actionable Intelligence: A Guide to Delivering Business Results with Big Data Fast! is the comprehensive guide to achieving the dream that business intelligence practitioners have been chasing since the concept itself came into being. Written by an IT visionary with extensive global supply chain experience and insight, this book describes what happens when team members have accurate, reliable, usable, and timely information at their fingertips. With a focus on leveraging big data, the book provides expert guidance on developing an analytical ecosystem to effectively manage, use the internal and external information to deliver business results. This book is written by an author who's been in the trenches for people who are in the trenches. It's for practitioners in the real world, who know delivering results is easier said than done – fraught with failure, and difficult politics. A landscape where reason and passion are needed to make a real difference. Big data makes big promises, but it cannot deliver without the right recipe of people, processes and technology in place. It's about choosing the right people, giving them the right tools, and taking a thoughtful—rather than formulaic--approach. Actionable Intelligence provides expert guidance toward envisioning, budgeting, implementing, and delivering real benefits. KEITH B. CARTER enjoys making the lives of others easier with technology and is an avid sportsman, private pilot, fencer, and family man. Born in Long Island, he spent most of his life in New York until moving to Singapore in 2012, where he currently resides. Always interested in both corporate and academic roles, Keith is working as Visiting Senior Fellow of Decision Sciences at the prestigious National University of Singapore Business School as well as principal advisor to KPMG, board member of Mentorica Technology Pte. Ltd. (a retail sales, mobile, big data solution provider), and board member of 1st Call Consulting, a competitive intelligence firm specializing in finance and supply chain. He previously worked at Estée Lauder in supply chain and Accenture in financial services and government. As an inventor, he recently received a patent on a financial intelligence tool design. Keith has a Master’s in Business Administration from Cornell University and a Bachelor’s in Electrical and Computer Systems Engineering from Rensselaer Polytechnic Institute.